Discussion in 'iPhone and iPad Games' started by TouchArcade Bot, Jun 15, 2016. 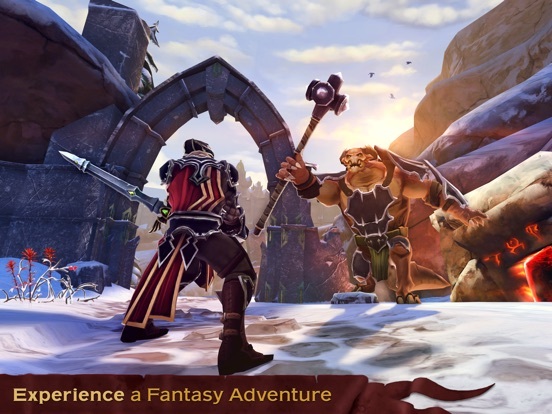 Experience an epic RPG adventure in the palm of your hand! Enter the demon-infested realm of Mourngard. Explore the ruins of a deserted world. Venture into the darkest dungeons and vanquish an unrelenting demon horde in this grand fantasy adventure. A forsaken land. A banished hero. Two brothers in strife. As you blaze towards the world of Mourngard, your angelic wings burn to ash. You and your brother are oblivious to the cataclysmic events you are about to spark, but your arrival could also be the key to salvation. Can Mourngard be saved? Uncover the truth behind the corruption destroying the once peaceful land. Challenge your reckless brother, and purge Mourngard of its demon occupation. The fate of the world is in your hands! 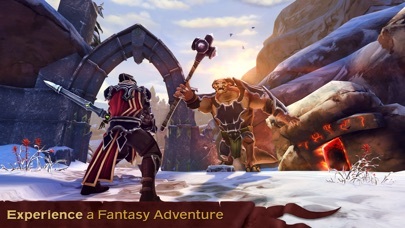 Game features: • Discover an immersive open-world fantasy adventure! • Experience thrilling hack’n’slash swipe combat! 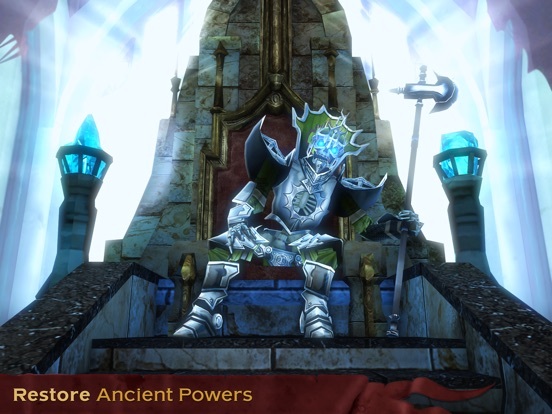 • Dive into an engrossing RPG campaign that will take hours to unravel! 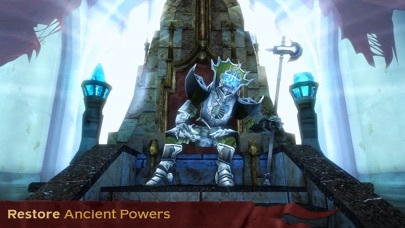 • Craft and enchant powerful gear to aid you on your quest! 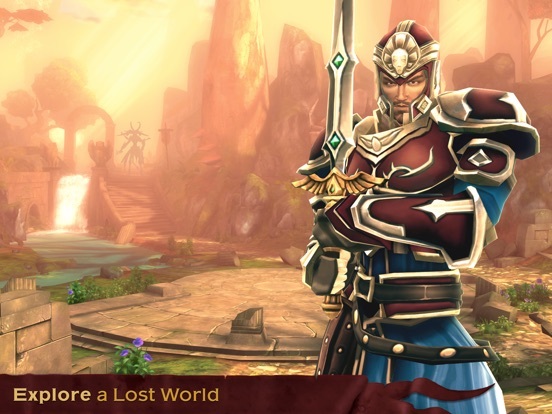 • Grow in strength as you forge the fate of Mourngard! Presented by Kiloo and Copenhagen Creators. Downloading now... Isnt there a soft-launch thread already? Or was that a beta thread? Sorry... A lil overwhelmed right now. 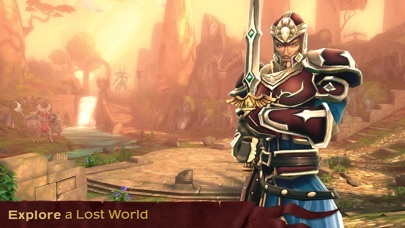 Does it actually offer open world movement or is this more of a Infinity Blade clone? It seems to be free movement. Tap to run, tap to stop. Change direction and move by swiping. Enter circle to fight enemies. Video ads to heal if you die. Do you have the graphic quality like the screenshot ? I'm on an iPad Air. It looks ok. Not as good as I'd hoped from the opening cinematic. It's the "free-to-play" dynamic that keeps me from hitting the BUY button. 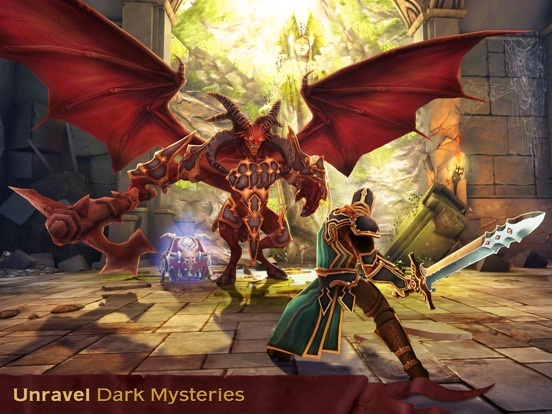 I recall the high hopes I had for Dungeon Hunter 4, and how all that potential was squirreled away behind ads and paywalls, ultimately killing the considerable fun of that game to the point at which I didn't even bother with DH5. After the amazing opening cinematics and the slightly polished screenshots the graphics disappoint a bit. But that doesn't mean it's not good-looking. 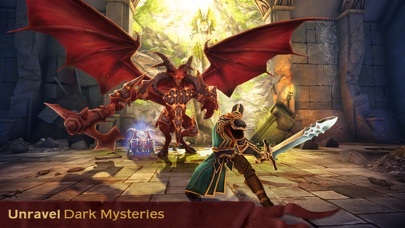 The game is more like beast quest than infinity blade. 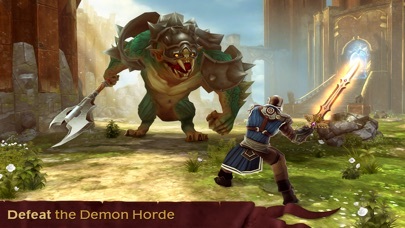 It borrows mechanics from infinity blade, but I won't call it a clone. The game is ambitious and I like that. I still don't understand how to block the attack coming from the right. The combat can be cheesed pretty easily. Just spam attacks in the direction you need to parry and you'll never get hurt. Hopefully it gets more strategic later on. I've played for @ an hour, IMO the 'quests' are very repetitive, the battle mechanics boring and the graphics turned really bad after 10 minutes of playing (all these compared to Titan Quest which I'm still playing daily). The "tap to move" controls made it more boring to play for me. Since i really like the Infinity Blade combat mechanics, i find this to be ok. It excels in a few parts, but fails in some. Seamless open world travel. No IB-inspired title has done this yet iirc. Can be played for free for quite some time. Not sure how long, but if Stormblades is any indication, the game difficulty could scale faster than you would be able to handle after a while. No timers that stop you from playing the game is a huge plus. And finally, there is a permanent purchase which doubles experience gained. Unfortunately, well... I'll save this for the ugly. Sometimes the framerate skips on my ipad air. If that happens while in combat, well, that's unfortunate. Can get very repetitive. Main gist of the free-roam gameplay is looking for objectives and tapping on them, and fighting enemies you can find. Controls are a huge issue when not done correctly. Stormblades was NEAR-PERFECT. This, kinda iffy. I dont know, i just dont feel it's as smooth. Maybe it's because of the framerate which is a bit unstable on my ipad air. First one i instantly noticed is how inferior the gameplay graphics is compared to the intro cinematic, or even to Stormblades. I think they had to sacrifice that to allow seamless transitioning between map areas which is both a good and a bad. Levelling up means free heal on level ups, and a few additional hitpoints. Havent seen other stats go up yet. This means that the experience doubler may not be as useful as say, material doubler. I'd pay $10 for that. Havent seen much variety in the gameplay, but im liking what i have played. The questionable part is how much im willing to do the same thing over and over in a free-roaming game. Stormblades was easier to adapt to, since the structure was "stage-based" and can be comparable with The Executive where each stage is a series of battles and action sequences. The turning speed/look speed/ sensitivity needs a slider option. Right now, on my ipad air it feels like i have to perform multiple long swipes to do a 180. The movement controls were inspired by Lili and Brandnew Boy which both worked well, but here, with the low default sensitivity to turning, it feels sluggish. Not unplayable, but could be better. Ads. Especially if they are your only choice to get past obstacles like free healing on revive or free stuff. They're not particularly bad since they are opt-ins, but still ugly nonetheless. You can power-level with real money. Buy tons of materials and just level up to how much you can spend. It's a singleplayer game, but ugly pay2cheat is ugly. Another ugly, which is on me, is that i cant help but compare this to Stormblades. It's definitely a freemium game, with a pay model that IMO leans towards the fair side of the trade. I recommend checking it out. It's pretty unique as far as the elements past the IB combat system. Im definitely going to play more of it, but i have my expectations in check so i dont get frustrated with the game if things get uglier further in. I hope the sensitivity had a slider, and i hope the game doesnt scale too fast that your stats wont keep up with the progress. 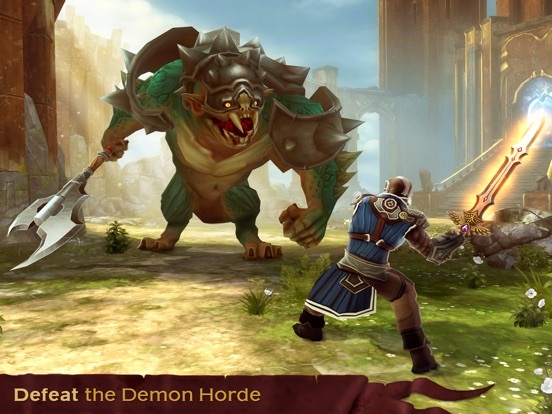 Two and half hours already into Dawnbringer and so far I like it since it does provide a lot of the usual Just one more Level Up and then i promise I will stop playing it - Gameplay Core Mechanics I loved so much in Games like Sacred Odyssey: Rise of Ayden from Gameloft or the Epic Games first Infinity Blade. Framerates Issues where the hole screen does freeze for one second complete - In 2,5 hours I had those at least five times and this should get definitly fixed since it did appear even during an Fight too . Blurred Textures - This definitly should get updated as soon as possible since at the current moment the Game does look a bit washed out and while I can understand why this was done for Devices with lower Hardware Specs there is absolute no excuse why i have to deal with it too on my iPad Pro/iPhone 6s+. At least give us an Option in game to switch between Higher and Normal Settings! Besides those three points I have to partly disagree with Exact-Psience about the Ads/iAP Parts in the Game. In over two and half hour I never felt that I "needed" to watch any Ad or get any iAP in the Game to be able to archiv anything in the Game. I never died once, even I got once really close to it. Instead all I had to do is run back and use some of those Health Stones that are placed on the Map in a way where, if you don`t use them when you don`t really need them, will always be enough to just keep you playing without feeling ever underpowered at all or rely on my Healthpotions at any moments in my playthrough so far while collecting enough itmes to be able to upgrade my current Gear. Dawnbringer is one of those Games where you can keep playing it for hours if you don`t get sick of some Grinding in the Game you have probably encountered already in Games like Diablo if you always want to make sure that your Gear is ready to move along in the Game instead of just rushing through it and then be surprised why you don`t do any damage at all to some high Level Monsters in the Game. After two hours with the Game I can really recommend it for those that want to take a break from Titan Quest and/or are still waiting for a new Infinty Blade/Sacred Game at some point and kill some time. Well written and useful, thank you. I'm surprised by the comments about the graphics and frame rate issues. I don't have any issues in my 6+ at all. No frame rate hiccups at all and the graphics don't look blurry or washed by any means. I'm up to the quest to fight the brother, but waiting on the timer for a sword upgrade to finish. So far the game has been really easy. I have only needed to use the potion once, and refilling it only costed some of the basic materials you find sitting around in barrels and whatnot. There's pretty much zero strategy in the combat. Just pay attention to the direction of the enemy attacks and spam attacks in the proper direction until the incoming enemy attack gets parried. Rinse & repeat until enemy is dead. It looks like I'm about to gain some kind of spell or something after this next quest. Hopefully the combat picks up after that point and gets a little deeper, but I'm not really expecting it to. Besides those three points I have to partly disagree with Exact-Psience about the Ads/iAP Parts in the Game. In over two and half hour I never felt that I "needed" to watch any Ad or get any iAP in the Game to be able to archiv anything in the Game. Coz this is what i basically said, just said it differently. Reason why my points were under The Ugly, and not under The Bad.